– GB’s World 4 x 100 silver medalist Dina Asher-Smith in an article talking about her work/life balance and the sacrifices she makes as a pro athlete. Katelyn Tuohy: What's Preventing Her From Attending/Competing In NCAA Next Year? T-Mobile CEO John Legere ran a 4:06 mile in High school, hobby jogged 2:53 marathon in his 50s. Whose jealous/mad? Why do people wear shorts over their pants (tights)? What would El G have run the mile in if he kept running after his 3:26.00? LRC Spoiler Alert: Christian Coleman’s 6.37 60m Mark Most Definitely Won’t Count As A World Record The IAAF rules are VERY clear – start reaction times must be recorded for a world record in any event 400m or less. Usain Who? MB: CHRISTIAN MF COLEMAN – COLEMAN OPENS 2018 WITH 6.37 WR!!! Coleman, who beat Bolt in London, opens 2018 with a stunner. *Christian Coleman Had To Drive Two Hours Away To Meet Drug Testers So He Could Give A Urine Sample At A Rest Stop Even still, Coleman’s run might not be ratified as the WR as the IAAF requires electronic startling blocks which weren’t used. MB: UTEP’S Michael Saruni Runs 1:14.79 600m WR Technically the 600m distance is a world’s best. Texas Tech’s Vincent Crisp Runs Fastest 600-Yard Time In Collegiate History – 68.16 – The old record of 68.26 (Arkansas’ Roddie Haley) had stood since 1987. Florida Star Grant Holloway Runs 7.49 60H To Move To #3 Collegian All-Time Omar McLeod is the collegiate record holder at 7.45. Good Read A 1,600-Word Look At How Kiwi Matt Baxter Has Thrived At NAU The NCAA runner-up in XC was a 14:10 man before he went to NAU. IAAF Visits Eugene And Is Assured Hayward Field Renovation Will Be Done In Time For Worlds The article says the new plans for the track will come out in April. Runner’s World: The 10 Best Onion Stories About Running Some might mistake RW for an Onion production itself. Even Rival Coaches Are Raving About Texas Tech’s New $48 Million Indoor Facility We’re pleased to report it features a legitimate (not oversized) 200 meter bank. What many love is the athletes in the warmup area can watch the action. Dennis Shaver of LSU says it’s “one of the best in the country.” Might it host NCAAs? 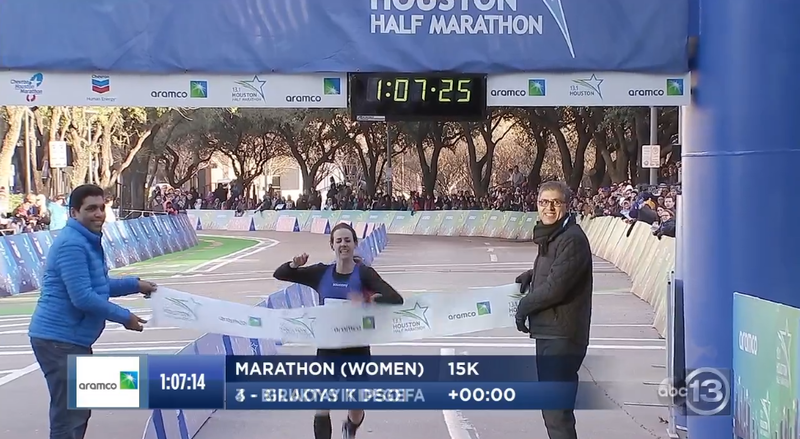 Edna Kiplagat, Sara Hall And Betsy Saina Will All Race At Marugame Half On Feb. 4th Zersenay Tadese leads the men’s field – but he hasn’t broken 60:00 since 2015. Paralympian Samuel Muchai Wins 2017 Sports Personality Of The Year Award (SOYA) In Kenya The blind 1,500/5,000 man beat favorites Conseslus Kipruto and Hellen Obiri. 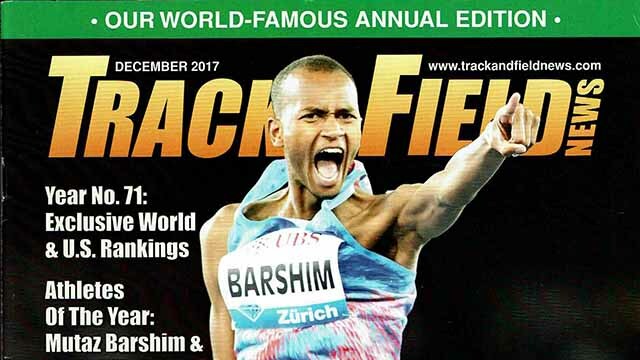 Spikes Mag Takes A Look Back At The Big Meets Being Offered In 2018 – “Things We Look Forward To In 2018” From World Indoors to the Continental Cup, they give you an overview of what to look forward to in 2018. Fast High School Action – Tuohy Runs 15:37! 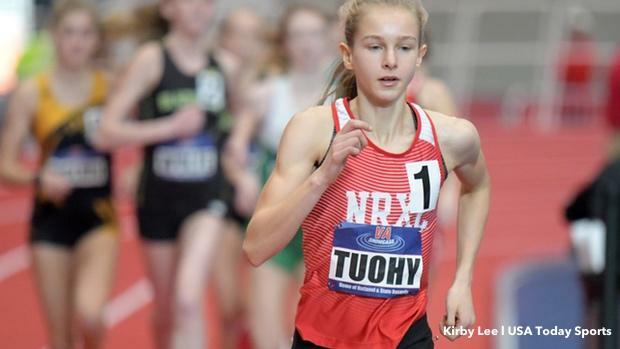 Katelyn Tuohy Runs 15:37 To Smash The High School 5,000m Record The previous indoor mark was 15:55 by Brie Oakley and Tuohy’s time is also faster than Mary Cain‘s 15:45 outdoor record. 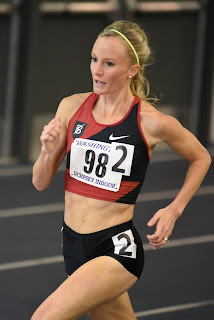 Fresh Off Her Great Edinburgh Win, Kelsey Chmiel Wins New Balance Games Mile In 4:48.94 Chmiel then doubled back to anchor the Saratoga DMR team to a win/meet record (11:59) with a 4:48.75 leg. Brian Herron Runs 32.64 To Break National High School 300m Record The previous record holder (Tyrese Cooper) was actually in the race and finished 3rd (33.12). MB: Matt Centrowitz Still With The Oregon Project, But Now Based On East Coast Centro says Alberto Salazar is still his coach, but he’s living in the DC/Maryland area with Centro Sr. administering a lot of his workouts. February 9: Deepest Field Ever Set For 2018 RAK Half Marathon With Fifteen Sub-60 Men Bedan Karoki returns to defend his title against 27:09 10K man Guye Adola, two-time Boston champ Lelisa Desisa and world indoor bronze medalist Augustine Choge. Athletics Weekly: Laura Muir Says She Has “More To Give Over 5,000m” In what was just her second 5,000 final, she finished 6th in a 14:52 PR at Worlds. Elaine Thompson Still Has No Idea What Happened In 100m Final Where She Was Just 5th It’s hard to explain as the double Olympic champ won all of her 100s in 2017 except for Worlds. European LJ Record Holder Sebastian Bayer Retires At Age 31 Due to injury, he’s barely competed since 2014 but is best known for his Beamonesque performance in 2013 when he went from 8.17 to 8.71 in a single competition. He’s still the #2 jumper indoors thanks to this. 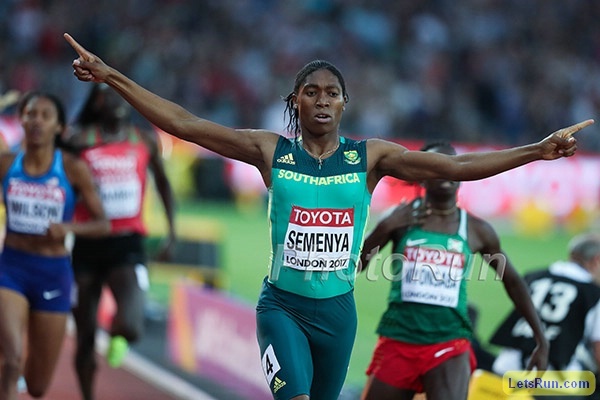 LRC Caster Semenya Free To Dominate For At Least 6 More Months As CAS Keeps IAAF’s Rules On Hypeandrogenism Suspended After a two-plus year wait, the IAAF got back to the court with what it hoped was proof that women with internal testicles and jacked up testosterone levels have an advantage over other women. The IAAF proposed new regulations that just cover the 400-mile. CAS has asked for more info. Sadly many following the case closely feel that ultimately the IAAF will lose. Disgraceful: Fancy Bears Is Trying To Act Like The IOC Is Bribing Doping Whistleblower Yuliya Stepanova By Offering Her $$$ The latest Fancy Bears hack shows email correspondence where financial arrangements for Stepanova are discussed after she risked her life to expose Russian doping. 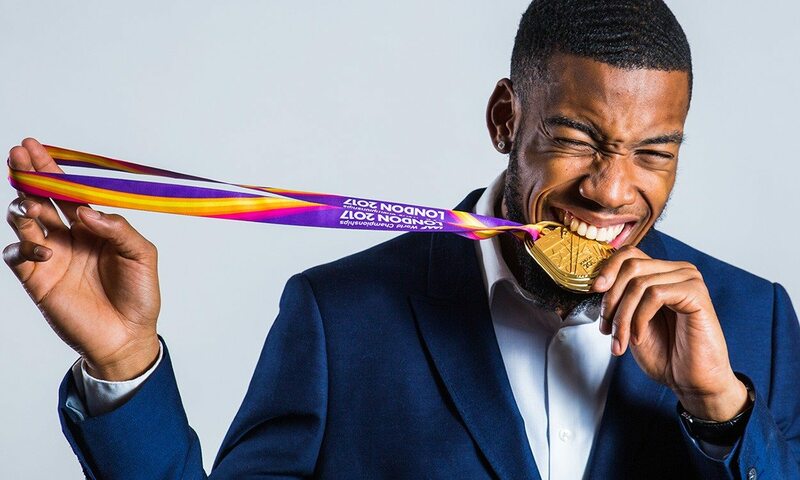 Former British Sprint Coach Claims Colin Jackson Was Called A N***** By His Own Hurdling Coach Jackson hasn’t confirmed or denied the report. Two-Time Olympic Javelin Champion Barbora Spotakova Is Pregnant With 2nd Child, Will Miss 2018 Season The 36-year-old world record holder says she’s still aiming to be in Tokyo in 2020. 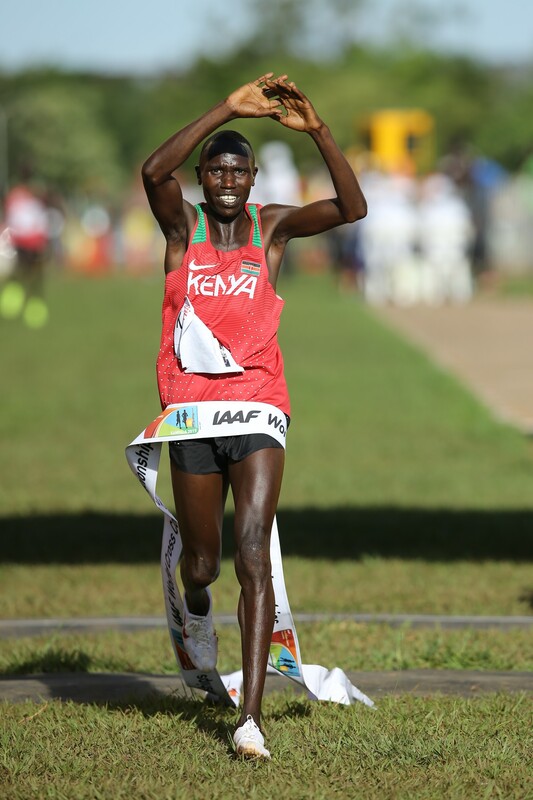 Athletics Kenya Unveils World Half Marathon Squad Two-time defending champ Geoffrey Kamworor and World Record holder Joyceline Jepkosgei lead the teams. Uganda’s World 10,000 Silver Medalist Joshua Cheptegei And Kenya’s Former World XC Champ Agnes Tirop Prevail At Seville XC Meet Tirop beat a field that included world 5,000 champ Hellen Obiri (3rd place) and steeplechase WR holder Ruth Jebet (4th). Ethiopia’s Gulume Tollesa Defended Her Title With A CR 2:29:37 At The Hong Kong Marathon 44-year-old Kenneth Mungara won over opponents half his age to win in 2:13:39. IAAF Weekend XC Round-Up: Kenya’s 9:03 Steepler Norah Tanui Wins Rovereto XC Meet By Over A Minute Ethiopia’s Telahun Bekele won the men’s race. Meanwhile in Kenya, Joan Chelimo won over 66:25 half runner Valary Jemeli at the Elgeyo-Marakwet XC Champs. Benard Kimeli won the men’s race. USATF’s Annual President’s Report To The Board Of Directors This is the first report of the Vin Lananna era. Kenya Paper Writes About How No Big Name Stars Are Doing Commonwealth Marathon Tim Hutchings has a GREAT solution – ax the marathon and run a half marathon. Big stars like Kipchoge could do it in their buildup for London. 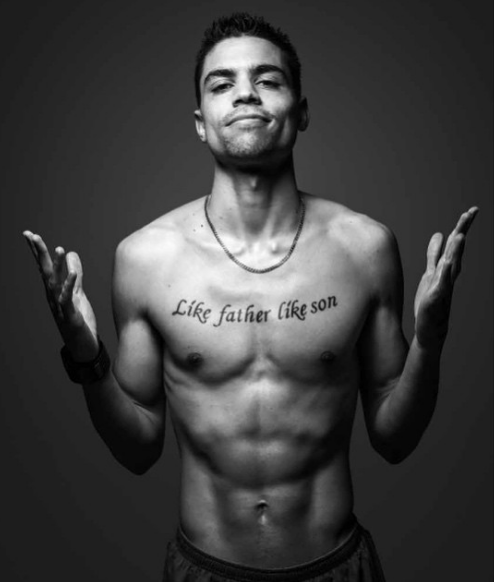 LRC Exclusive Reigning Olympic And World Indoor Champion Matthew Centrowitz Will Skip 2018 Indoor Season, Race In Australia Instead In other Centro related news, we have learned that Like Father, Like Son, the memoir by Matt Centrowitz – Matthew’s father – may be turned into a feature film. Feb. 10th: Raevyn Rogers Will Race 800 And Christian Coleman, Noah Lyles And Cameron Burrell Will Clash In 60 At 2018 NB Indoor Grand Prix The women’s 800 also includes Sifan Hassan of the Netherlands and Great Britain’s Lynsey Sharp. Get your tickets now. Say It Ain’t So – Hayward Field To Be Demolished? Will London’s Crystal Palace Also Be Demolished? The future of Crystal Palace as an athletics facility hangs in the balance with a sports consultancy company due to deliver its verdict on the venue next month.